If your New Year’s resolution was to improve your job posts, you’re in luck. Unlike going to the gym every day (nope) or eating less cake (can’t do it), this is a resolution anyone can keep—with the help of a little data. 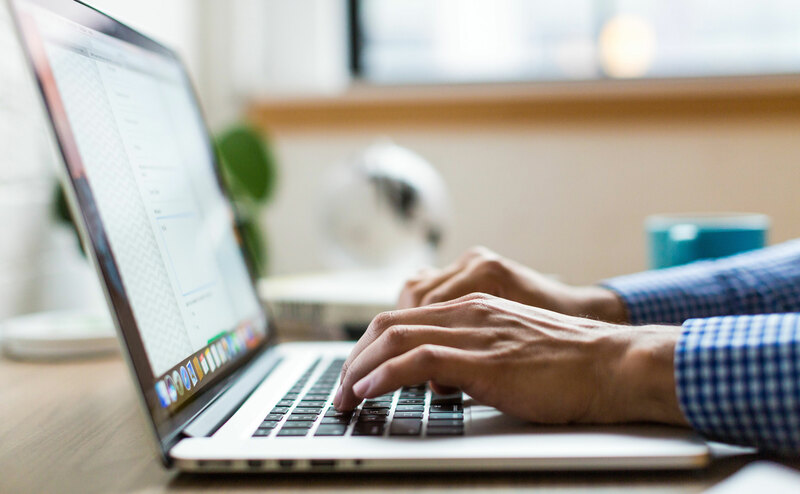 Since your job posts may be the first interaction a candidate has with your company—and since they may be scrolling through dozens posted by your competitors—it’s essential to spark their interest and earn a second glance. How you craft your posts and when you upload them can make all the difference. Level up your job posts in 2019 with these 6 handy tips, inspired by insights from recent LinkedIn data. That said, posts that are 601+ words also tend to do slightly better than average, earning 1% more applications per view. If you use the longer word count to share more enticing details about the role, candidates will stick around to read them. But unless you have some incredible information that you know candidates will love, as a rule of thumb, it may be best to keep things short and sweet. If you’re trying to cut your job description down below that 300-word sweet spot, it helps to know what information candidates prioritize when they’re reading your post. Perhaps unsurprisingly, the majority of candidates (61%) say details about compensation are what matters most. 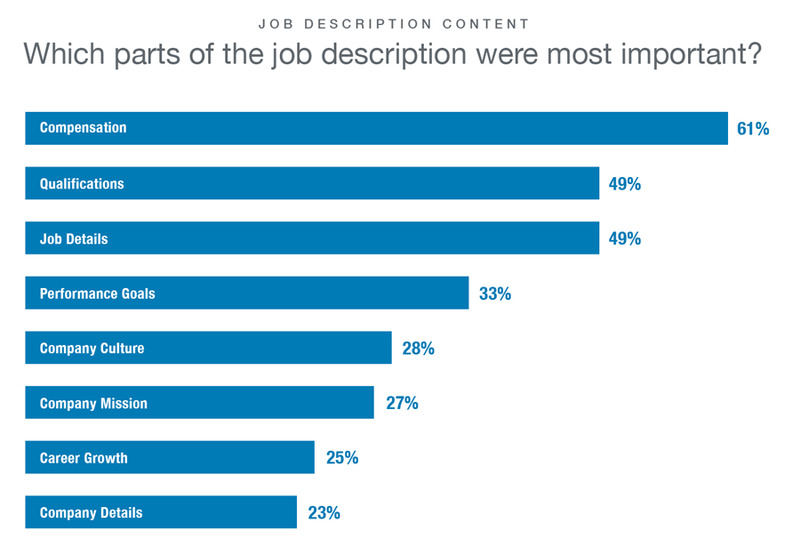 Of course, candidates also care a lot about other aspects of the job, with qualifications and job details tying for second place in the importance category (49% apiece). But first and foremost, they want to know if the job will support them and their family. Pay transparency can be a double-edged sword, so it’s important to weigh up the pros and cons before including a salary range in your job posts. On the one hand, it lets candidates know instantly whether the job is financially viable for them and if it’s worth their time applying. It can also streamline the conversation later in the hiring process, since candidates know what to expect. On the other hand, talking about compensation up front may draw attention away from the opportunity at hand. Many candidates will choose a job that pays less money if it offers the right opportunity, so there’s a good argument to be made for keeping money off the table for now to focus on why this job is the right step for their career. Whether you include a salary range or not, consider mentioning other important benefits that candidates will care about. (Hint: 44% of candidates say that more traditional benefits like health coverage, parental leave, and PTO are what will keep them at a company for 5+ years, so focus on these over quirky perks.) Then, give clear and useful information about the job opportunity itself—like which skills and qualifications are required, what the day-to-day responsibilities look like, and why it will give candidates a real sense of purpose in their work. Your company culture is a vital recruiting and retention tool. But candidates don’t want to hear about it in huge detail from the word go. When they’re first browsing your job post, the information mentioned above matters far more to them than details about your culture, with only 28% saying it’s the most important part. That doesn’t mean you can’t mention your culture at all. But don’t go into too much detail—just pepper in a few highlights, and trust that they’ll visit your website if they want to learn more. More than one in four candidates (27%) will use your website to discover insights into your culture, so be sure it paints an enticing picture to complement your job posts! While your job post isn’t the best place to talk about your culture, it’s still best to keep culture on your mind while you write. That’s because the tone of your post should be closely tied to the vibe of your company, or it risks giving candidates the wrong impression. 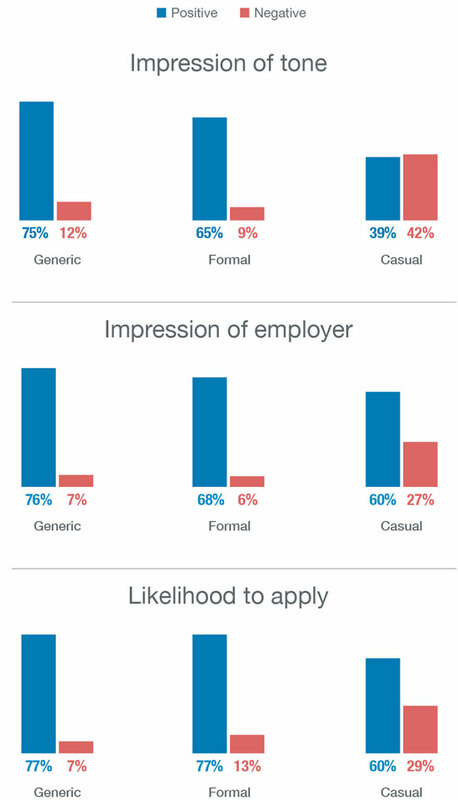 LinkedIn found that job posts that are overly casual in tone tend to perform worse than more generic or formal posts. 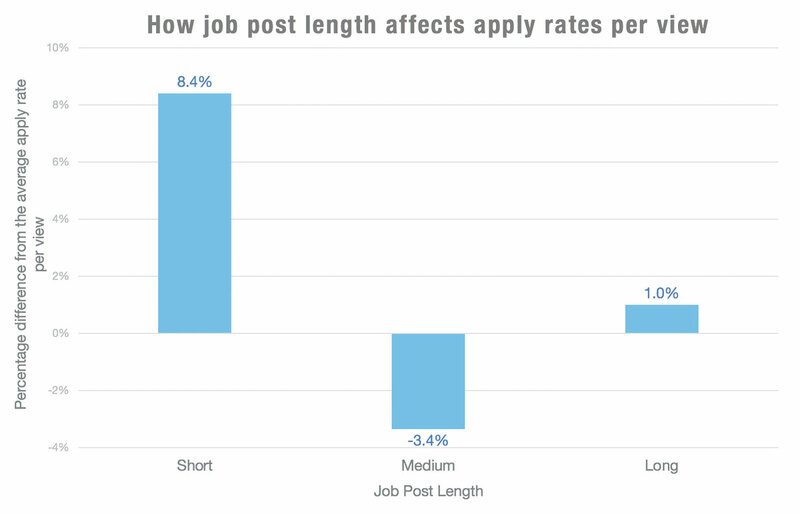 Candidates are 2-4x less likely to apply, and 4x more likely to view the company negatively. It makes sense: if your industry is fairly buttoned up and formal, a casual job post might come across as unprofessional. On the other hand, if you work in a more creative industry, this tone might find a more receptive audience. Ultimately, the tone you use should give candidates an authentic feel for the atmosphere at your company. An unconventional business shaking up a highly traditional industry might opt for a laid-back tone, and that’s okay. You might get fewer applicants overall—but the ones you do get may be better suited for the environment and role. If diversity and inclusion efforts are a priority at your company this year, here’s one easy way to fill your pipeline with more diverse applicants: nip gender-coded job descriptions in the bud. LinkedIn found that after viewing a job, men apply 13% more often than women. And the language used in job posts is often the culprit. “Masculine” words and phrases like “aggressive,” “dominant,” “outspoken,” and “rock star” tend to put women off from applying. Luckily, it’s not difficult to scrap these words and opt for more broadly appealing alternatives. There’s even a free app you can use to spot any masculine language in your job descriptions before your post them. 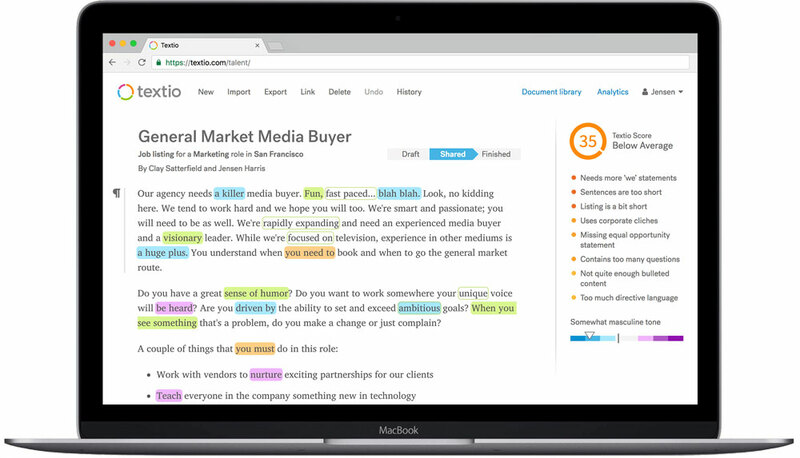 And if you need help replacing a phrase or two, augmented writing platform Textio can help you quickly gauge the gender balance of your job description, all while suggesting more inclusive and effective alternatives. You’ve written your concise, informative, tonally appropriate, gender-neutral job description and you can’t wait to send it out into the world. But sometimes, waiting is in your best interest, especially if it’s 5pm on a Friday and you’ve got one foot out the door. Guess what: candidates are ready for the weekend, too—and they won’t be racing to apply while they’re enjoying their days off. LinkedIn found that—shocker—Fridays, Saturdays, and Sundays are the absolute worst days to post your job. Viewing and application rates are highest on Mondays, gradually declining as the week goes on. With more than half of all views (59%) and applications (57%) taking place between Monday and Wednesday, it pays to catch candidates early in the work week. So if you tend to write job descriptions at the end of the week, try designating some time every Monday morning to give them a final read and hit post. You know how to sell a job and get candidates interested. But by looking at the data to see what works and what doesn’t, you can attract an even bigger, more qualified pool of applicants for every job you post. Keep it short, sweet, and authentic, focus on what matters most using language that appeals to everyone, and post at the right time to reach the right people. Then sit back and watch the candidates role in!